Personalize your favorite Recipes with this Fall In Love Themed Recipe Card. •The recipe cards will be printed as shown... Double Sided... in the size of your choice. 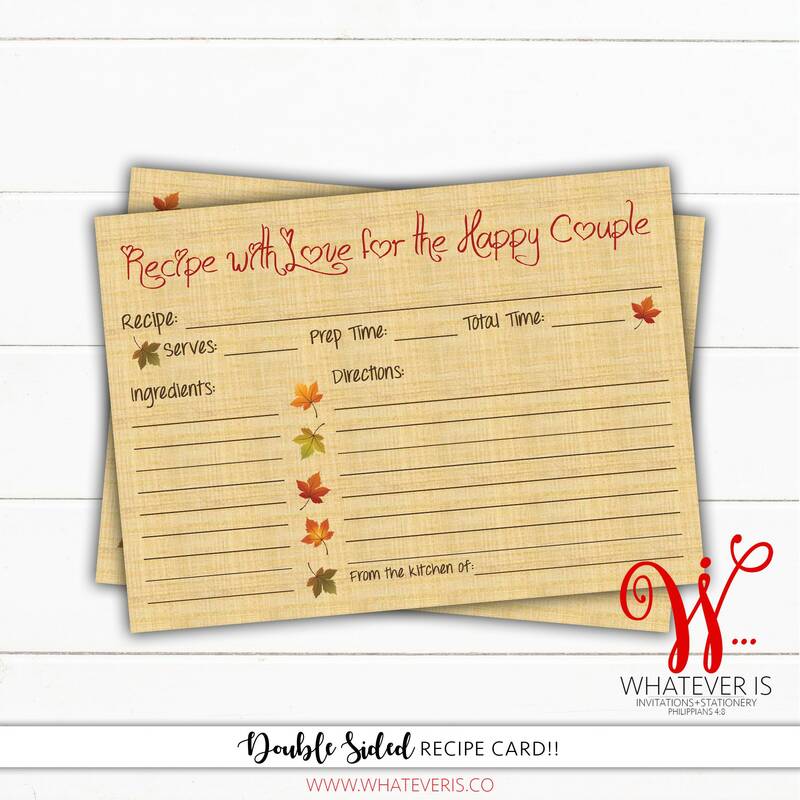 Your recipe cards will be printed on high quality card stock. 1. Decide and choose the size of recipe card you need. 2. Choose the Print quantity you need and add it to your cart. - Printed orders are processed within 24 hours of cleared payment. - Printing turnaround time is 3-5 business days (Monday-Friday). - Order will then be shipped via USPS 2-3 day Priority Mail. >>The price for printing includes free shipping for deliveries to locations in the Continental United States via USPS 2-3 day Priority Shipping. >>Orders shipped to Alaska, Hawaii or any international destination will be billed an additional shipping charge. -Due to different monitors displays, the colors may vary once printed. -The invitations and printable's are for PERSONAL USE ONLY. You may print as many as you need. However, they are in no way to be shared, re-sold, or recreated under any circumstance. -Customization is made by Whatever Is..., customers can not make any changes any digital files. Copyright © Whatever Is... 2018, All Rights Reserved.